The full list of applications is too vast to list and in some cases the application so novel or sensitive they cannot be published. We are application specialists. Thermal and electromagnetic modelling can be carried out on most enquiries enabling the outcome to be anticipated well before purchase. 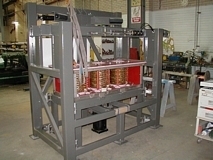 Having had experience in design and fabrication of induction heating equipment spanning many years, Furnace Engineering has built up a respect and trust in certain power supply types and manufacturers for different applications. Consequently in most cases, the most cost effective and appropriate power supply is sourced from our trusted industry partners who rely on us to engineer the application and provide the local support. In this way the client enjoys local support combined with access to modern, efficient and appropriate equipment from a proven and reputable power supply manufacturer. Furnace Engineering is proud to be able to offer the Ambrell range of induction heaters for a wide range of typical induction heating applications.